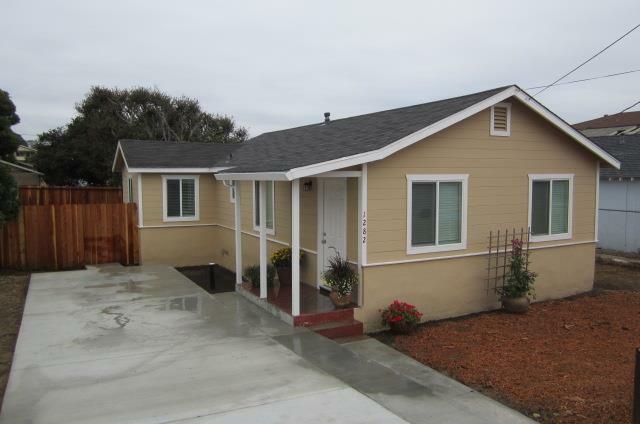 Cute bungalow in Del Monte Heights totally remodeled from top down in 2012. New electrical, new plumbing with tankless water heater, new windows, new roof (I think? ), new appliances, new cabinets & of course, painting. All done by a licensed contractor with permits. That was in 2012. It's been a rental for the last 6 years so there will be some wear & tear but nothing that can't be cured with a good scrubbing using some elbow grease & fresh paint. No garage but a deep concrete driveway could easily accommodate tandem parking. Newer wood fencing surrounds this delightful nearly 50' by 100' lot. Certainly lots & lots of room to roam in that back yard! Can you imagine patio table & chairs, hammock and firepit? And hardscape with large red-clay potted plants in walk-around paver pathways? Majestic oak tree provides shade for outdoor napping during our warm fall days! Large and sturdy storage shed in backyard for all of your stuff too.